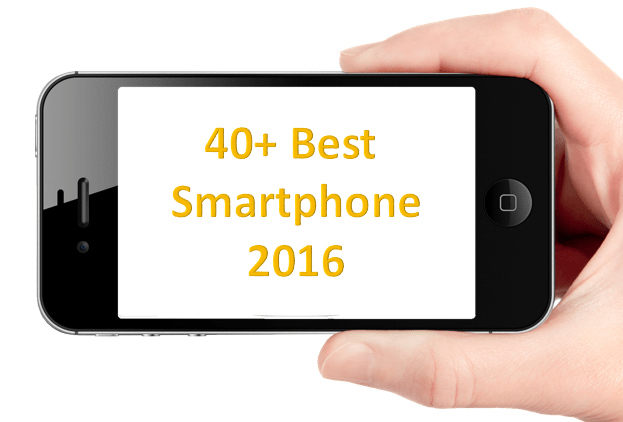 We all keep changing our smartphones every now and then for a plethora of reasons. The world of technology is advancing at such a rapid pace, our latest flagships become a piece of brick maybe after a year or two. Nothing can be done about it, but we should all be thankful to technology for offering us new innovations every single day. Moving our attention to smartphones, we all replace our smartphones only for a few reasons, which vary from person to person. 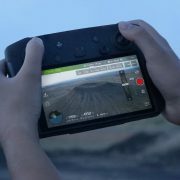 Sometimes we might get fed up with a single camera setup, and leap in for a one with multiple cameras, and sometimes for playing Asphalt 9 at 60 for with all those glorious effects. There can be a number of reasons we want a new smartphone, and this article is not a guideline to help you choose the most appropriate beast as per your requirements. While we all choose our new smartphones by having a look at the features and the price it is offered at, we sometimes forget to look at one of the most basic things, which seems to be worth considering. It is the SAR value. SAR or the Specific Absorption Rate isn’t an indicator of how feature-rich a smartphone is, and maybe that is the reason, we hardly ask the salesman about the SAR value of a smartphone. So let’s find out what is the SAR value, and after that, should you consider it before purchasing a smartphone? Needless to say, our mobile devices connect with the nearest cell sites through electromagnetic waves, which can’t be seen with naked eyes. The signals are transmitted and received in the form of a spectrum of radio waves, the frequency of which lies somewhere between 450 MHz, and 2.1 GHz, however and it depends upon the carrier, the type of mobile technology, like 2G, 3G, whichever is used. These waves carry everything for the purpose of communication, like our voice, data packets, messages, and whatnot. The radio waves though are transmitted in every direction, irrespective of in which direction the cell site actually exist. But, the cell site is not the only point where the radio waves reach, as many objects in between, can even absorb those signals, and the human body as well is not an exception to that. So SAR or Specific Absorption Rate is the number that defines how much electromagnetic radiation, our body absorbs, while subjected to the electromagnetic waves, or at the time we use our mobile devices. That is it. SAR value is associated with every single mobile device you see around, and thus, you cannot keep using your mobile device, and be free from electromagnetic radiation, both at the same time. But, don’t be too frightened! There are a lot more to say. 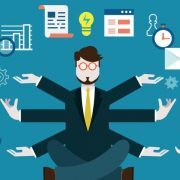 How is the SAR value calculated? SAR value for mobile devices is calculated on a certain mass of body tissue or the complete human body in talking position. SAR value is defined as the amount of energy, calculated in watt absorbed, per unit mass, generally calculated in Kilogram or Kg. The SAR value is calculated by keeping the mobile device at different distances from the human body and head under different network conditions and circumstances, and each time a different value is observed. But, the SAR value of a mobile device is always rated with the worst case scenario or the highest calculated value under the testing conditions. So the SAR ratings for your mobile device is thus, the maximum absorption of the radiation by your body while the handset emits maximum radiation. Generally speaking, the absorption should be less in everyday situations than the actual SAR ratings of your handset. 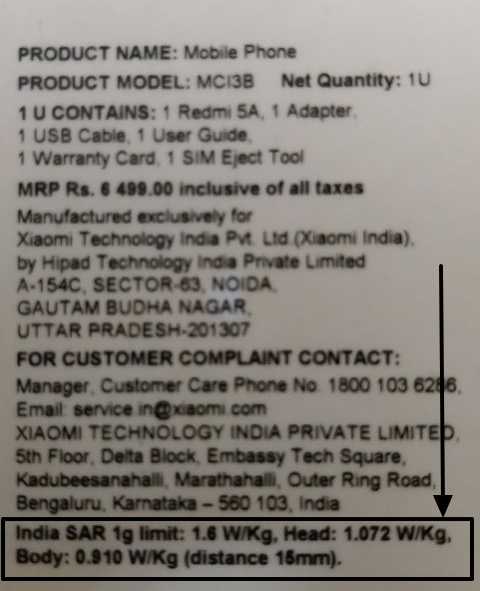 Just consider, the SAR rating for your new handset is 0.7 Watt/Kg. What that means is that a 1 Kg mass of your tissue will absorb a maximum of 0.7 Watt power or radiation, but in the worst case. Now depending upon the manufacturer of the handset and for a number of other reasons, the SAR values for different handsets vary. But there are some safe and standard SAR limits, and the mobile devices cannot have the SAR values more than those standard limits to be sold in the market. 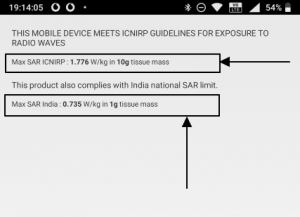 In the US, the standard SAR value is 1.6 Watt/Kg tested on a tissue sample of 1 gram, and all the mobile devices available in the US market should have SAR values below or equal to the standard rating i.e. 1.6 Watt/Kg. While in the European countries, the standard values are 2.0 Watt/Kg but tested on a tissue sample having 10 gram of weight. In India, the SAR value is the same as that of the US since 2012, and it is 1.6 Watt/Kg. But India doesn’t depend solely on the tests done by the manufacturers and thus, India carries out random tests on the handsets for compliance in its own government-run centres. 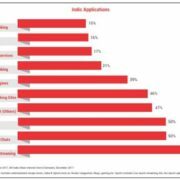 Some brands and some specific devices from certain brands are known for having notorious SAR values, but you better don’t worry about it. The phone in your hand or the one that you are planning to buy is available in the market only after thorough tests, and the devices have passed all the necessary hurdles to be available in the market for the consumers. How to find the SAR value of a handset? The SAR value of your handset should be clearly written on the box, and it should also be written on the shopping websites, where they are available for purchase. Though that is optional, the SAR value should also be written on the user or instruction manual of your handset. Just in case you don’t have the box or user manual, you can see the SAR value of your handset by dialling ‘*#07#’ on your dialer app, just the way you can find your handset’s IMEI by dialling ‘*#06#’. How reliable are the SAR values? SAR values are reliable, but that shouldn’t be a criterion while choosing your next handset. Why! I will be explaining that. SAR value is used just as a reference to know whether a handset should go on sale or not. Let me explain with an example, why SAR values can be apparently misleading at times. Just consider there are two handsets X and Y. The handset x has a SAR value of 0.7 Watt/Kg, while the handset y has a SAR value of 0.9 Watt/Kg. Apparently, the device x seems to be better among the two for having a lower value of SAR, but wait! The device y might have led to the SAR value reading of 0.9 Watt/Kg in the worst case, and the other readings in different testing conditions can be around 0.5 Watt/Kg, 0.6 Watt/Kg or so. But the device x, on the other hand, might have shown 0.7 Watt/Kg in the worst case, but the other readings could be close to it, like 0.6 Watt/Kg or so. As the worst case scenario is always considered to give the SAR ratings, the device x seems to be better than the device y. But in real life, the device y will lead to lower radiations, as the average readings, which isn’t considered while rating is better for the device y, instead of the device x. Thus, SAR value can be misleading, and better don’t pay exaggerated attention to it, next time you choose your smartphone. Though the radiation from your smartphone is always within the safe limits, there are some ways to reduce the emission if you are too concerned about it. Here are some of the practical ways to reduce the level of radiation absorption by your head and body. Use a headset or the speakerphone mode: You can use a wired or a wireless headset with mic to make or receive calls, and that is one of the best ways to keep absorbing as less radiation as possible. 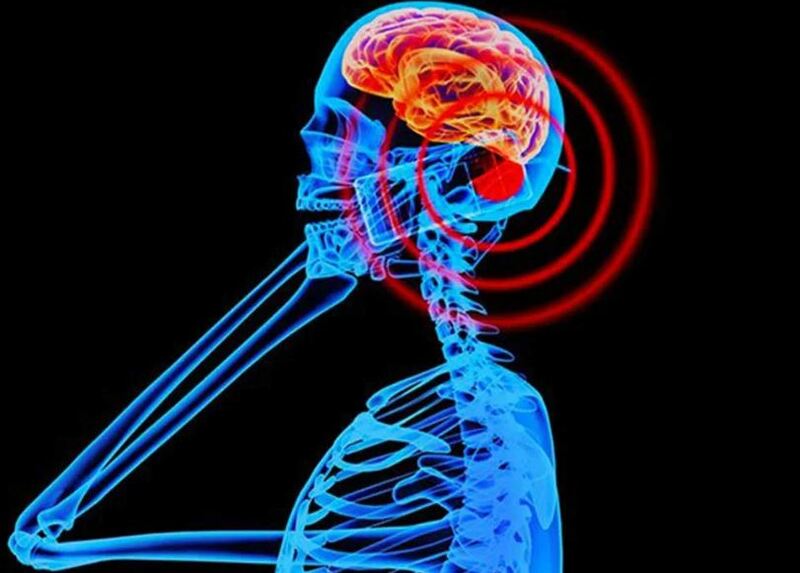 That way, you will not have to keep your handset too close to your head or body, which will hence reduce the absorption of radiation by the head and body. Alternatively, you can use the speakerphone mode if nobody is there around you, and the environment isn’t very noisy. That way, you can reduce the absorption both by your body and head, while making or receiving calls. Just in case, neither of the options are feasible for you, you can hold your handset at a little distance from your head to mitigate as much absorption as possible. Limit using your phone in low coverage areas, and while moving: In areas with very low coverage, your handset struggles to maintain a connection and keep the call going. The radiation and hence the absorption is thus higher than normal in such situations. The same situation persists when you are moving. However, in both the cases the absorption by your body will be less than or equal to the rated SAR values for the particular handset you are using. Just in case you are not attending any important calls, better use your handset while you are not moving, or you are at a place with weak network signals. Lessen your overall phone usage, or use the flight mode: Today we all are kind of addicted to our mobile devices, kudos to its unending abilities. But cutting down the screen time by a few minutes can be useful if you are too much concerned about electromagnetic radiation. Just in case that isn’t possible for you, switch to the Flight or Airplane Mode to carry out some offline activities on your handset or at least play some games to entertain yourself. Most popular apps of today like YouTube are optimized for offline usage, and you can take advantage of those to at least reduce the radiation by your mobile device for a few hours. Hope you are no longer afraid of SAR values. No, they aren’t something that overwhelming to care about so much. Just choose your next smartphone with confidence and have fun using it. Do you still have any kind of questions in mind? Feel free to comment the same down below.